ISLE is a brand name that people have come to trust. They provide quality and extreme durability in all of their iSUPs. The ISLE Airtech 11ft Inflatable Paddle Board is their newest addition and is lighter than ever before. You just have to decide if you want to give it a try. 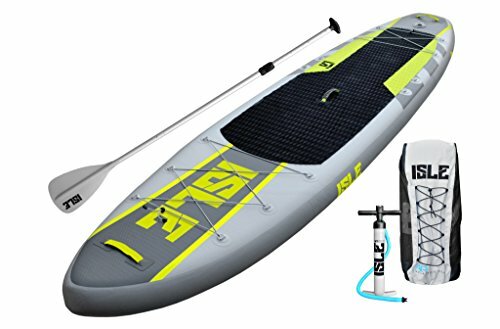 The new ISLE Airtech uses Fusion-Lite construction to give you an inflatable paddle board that is 30% lighter than all others of a comparable size. This means that the board weighs only 20 pounds to ensure carrying it is easy. However, even with the light weight of it, it can still support up to 215 pounds. Keep in mind that when you are carrying the pump, paddle and other supplies, the weight will increase to approximately 32 pounds. It is designed to give riders options. There are 14 individual D-Rings and two bungee systems. This means that you can carry all the gear you need along with you. Even if you plan to venture out for a few days, stopping to camp out and relax in remote locations along the way. It comes with a carry backpack, the pump, fins, a repair kit, and a travel paddle. The paddle is able to float and breaks down into three sections to ensure easy transportation. The high pressure pump is hand operated and guaranteed to get your iSUP up to the recommended 15psi. As with all ISLE products, this inflatable paddle board is backed 100% against workmanship or material defects for two years. This means that if you have any issues that go beyond normal wear and tear, you can get help to get it fixed. There is also a 30 day love it or return it. This means if you try it out and are not completely happy, you can return it for a full refund within 30 days. It is also a larger iSUP at 11ft long by 32in wide. It inflates to 6in thick to give you a firm foundation to stand on while paddling. This is further increased by the fact that there is a no slip cover on the top and military grade materials for you to stand on. With the included pump, most people can inflate this paddle board to 15psi within only a few minutes of time. Some it does take longer, because as you reach closer to the 15psi range, it does get harder to pump. Others say 5-6 minutes is all that it takes. A lot of people like that it is able to fold up and store in very little space. This means people with small cars can still enjoy the wonderful sport of paddle boarding. They also love that it is so durable and perfect for beginners to learn how to enjoy stand up paddle boarding. Most say that it is stable enough in the water for people who have never tried it to be able to stand like they have been doing it for years. Does not ship to international areas. This means if you do not live in America or know someone who does, you may not be able to purchase this inflatable stand up paddle board. One person has had issues with it leaking and because he recently moved to another country, he cannot get help. For most people, this would not be a concern, but if you are planning to move in the near future, you may want to keep it in mind. As with all products, you have people who say that it could be better than it is. However, most are satisfied with its overall performance. This means if you want a quality board to learn on and enjoy, even as an experienced paddle boarder, you may enjoy having this iSUP. It is lightweight and very easy to transport. The ISLE Airtech is stable and does not feel tippy at all. What more could you ask for from your inflatable stand up paddle board?